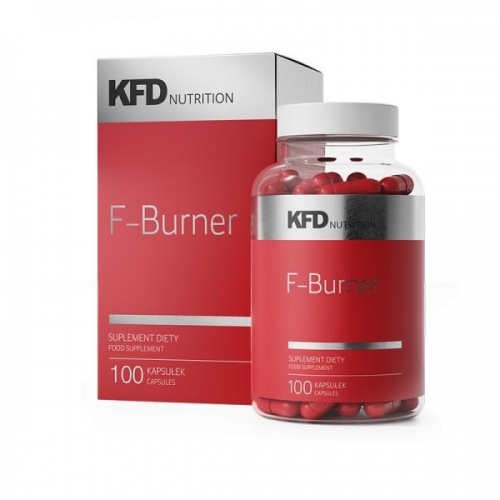 F-Burner is an advanced fat burning product. Recommended consumption: It is recommended to consume 1 serving (4 capsules) per day. Take all the tablets and drink with water. 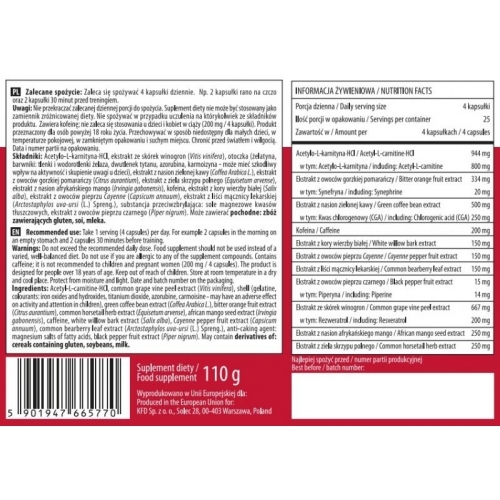 Ingredients: Rubus L. raspberry extract, standardized to 98% raspberry ketones, gelatine, Citrus aurantium L. bitter orange extract, standardized to 6% synephrine, DER 10: 1, caffeine anhydrous (caffeine), orchid extract, Dendrobium nobile, standardized on 1% alkaloids, cocoa beans extract, Theobroma cacao L., standardized to 22% theobromine, white willow extract, salix alba L., standardized on 15% salicin, Cayenne Pepper, DER Arctostaphylos uva-ursi, DER 4: 1, Ginger rhizome extract, Zingiber officinale Roscoe, standardized on 5% gingerol, DER 15: 1, anti-caking agent: magnesium salts of fatty acids, silicon dioxide , iron lactate (iron), Indian root net extract, Coleus forskohlii, standardized for 20% forskolin, black pepper extract, Piper longum L., standardized for 95% piperine, oxygen dyes iron and iron hydroxides and titanium dioxide, chromium picolinate (chromium).